The Virginia basketball team plays in its first Final Four since 1984 in Minneapolis on Saturday. That’s a perfect time for another “Ask The Sabre” segment presented by AskLandis.com. Here are some answers to questions about the Cavaliers. Sabre Editor Kris Wright tackles the questions in this edition. Sabre Editor Kris Wright: “Diakite whisperer” makes me laugh because I think we’ve all watched Mamadi Diakite’s sort of go from Bambi to Baryshnikov with his development. He’s been calling Coach Williford “Magic Man” himself lately, which Williford deflected as coming from some post moves and a little encouragement. Honestly, though, I think the key is confidence. Whatever Coach Williford and Coach Tony Bennett said to Diakite recently has allowed him to play more free and more confidently. I remember former UVA lacrosse coach Dom Starsia saying once that ‘confidence is miracle drug’ and I think that more than anything is what we’re seeing as of late. Sabre Editor Kris Wright: Possibly, but not to an extreme. There might be a wrinkle or two, but you’re not going to spend your short preparation window with all the other things going on to test players mentally trying to completely change the way you play. That’s a recipe for disaster, in my opinion, as a coach. I’d expect more time has been spent on working on fine-tuning what Auburn normally does and building confidence in the players who are going to get more minutes. Auburn Coach Bruce Pearl even did that publicly with some of his comments on Thursday when he said: “Does the idea of a little bit more Austin Wiley, Anfernee McLemore, Horace Spencer, and Danjel Purifoy, does that sound good? I think the answer is any of those guys does sound good.” So, yeah, I think the challenge is an emotional one not a strategic one for the Tigers. Sabre Editor Kris Wright: The previous answer probably hints at what’s coming here. I am sure that they’ll stay the course for the most part. You might see a small wrinkle here or there. An example would be setting a screen near the elbow to get De’Andre Hunter diving toward the blocks – a UCLA screen – that we’ve seen the Hoos use a little bit since the ACC Tournament. I don’t recall it much before that. I think you may also see some moments of things you’ve seen before, but not often if needed. So like the elevator screen decoy that puts Hunter in isolation. The biggest place I think you could see a small wrinkle or previously unseen play would be on a baseline inbounds set. Auburn showed vulnerability to giving up layups there against Kentucky and UVA has some gravity-drawing cutters like Kyle Guy that could open up a slip to the rim for someone else. 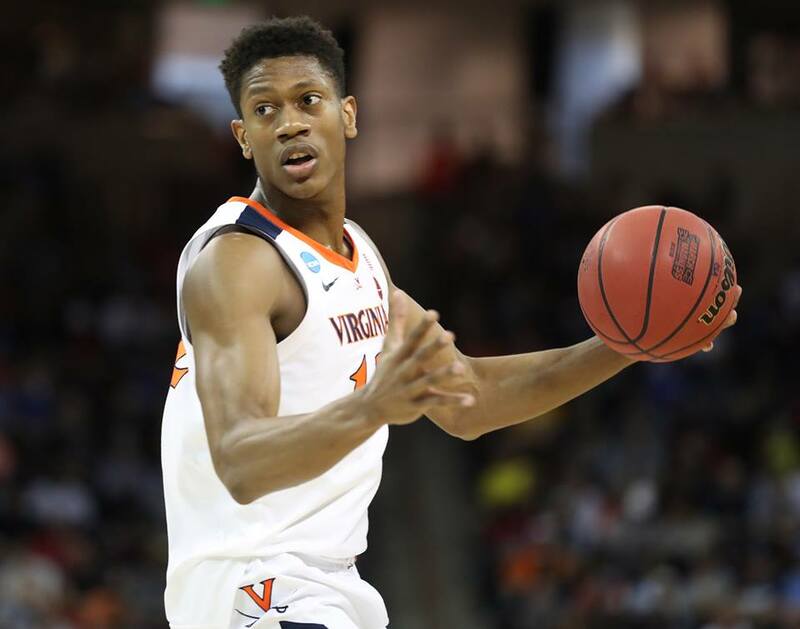 Sabre Editor Kris Wright: I’ve seen this storyline a little bit lately and know UVA players were asked about his scoring a little bit here in Minneapolis. I don’t get it. The biggest thing I’ve seen is that Hunter continues to be a little less assertive than many would like, particularly in small ball lineups where he’s being used as a screener a fair amount. Hunter has attempted single-digit shots just twice since the Pittsburgh game, those coming against NC State in the ACC Tournament when he went to the free throw line 10 times instead and Oklahoma in the round of 32 when he took 9. In the other six games, he attempted 13-13-12-16-13-10 for an average of 12.8 shots per game. Lastly, I think Hunter has played his best defense of the season over the last four or five games. He was great against Oklahoma and Oregon. I thought he played great defense against Carsen Edwards too other than a couple of moments where he got caught with his hands too low not expecting Edwards to shoot it from that far away. Virginia’s going to need that defense again at the Final Four. Sabre Editor Kris Wright: The team scouts and prepares for both. This goes on throughout the season and won’t change for the final weekend. Usually, one assistant is assigned the lead scout on a team and another assistant is assigned the lead scout on the team after that and so on in the regular season. It wouldn’t surprise me if the coaches divided things up in pairs at this point since there are a maximum of two games left, but they definitely completed scouting work for both teams for the trip to Minneapolis. Keep in mind that the video assistants for the program cut up film into categories and make the scouting process very stream-lined at this point. So you’d have a batch of Auburn transition clips and a batch of Auburn dribble handoff clips and so on for example. That makes it easier to do multiple scouting jobs at once these days.